Twenty-eight lorries have brought fracking equipment on site at the UK's first horizontal shale exploration wells, an energy firm has said. 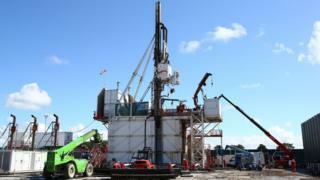 Cuadrilla said the equipment was brought to its Preston New Road site in Lancashire at 04:20 BST. The energy firm has received government consent to extract shale gas at two wells at the site and has said work will begin in "the next few weeks". Protesters said they were "devastated" to see the lorries arrive at the site. Katrina, who has been outside the site for 18 months, said the arrival of the "fracking convoy" would not affect the protests. "Obviously we're devastated... but this isn't the end. We're here to fight until we win," she said. A trespassing ban at the site was recently extended for two years. The energy firm's chief executive Francis Egan said he was "delighted" the company now had permission to use both wells. "Following hydraulic fracturing of these wells, Cuadrilla will run an initial flow test of the gas produced from both wells for approximately six months," he said.